About Us – Baxter Verticut Inc. Thank you for your interest in Baxter Verticut. 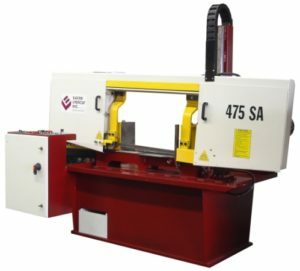 We are a Canadian manufacturer of metal cutting bandsaw machines. The company was founded in 1982 and is located in Toronto, Canada. We have a standard line of products that consists of various models to meet a wide range of applications. These models can be viewed on this web site. We also manufacture custom bandsaws to meet the requirements of our customers. This can include specific cutting requirements of speed, capacity or material clamping applications. We also manufacture machines to automate repetitive cutting such as notching of tubes. We have made mirrored sets of machines for integration in larger automation projects. Our products are of high quality and have an excellent performance to cost. This allows us to provide our customers with a profitable, accurate and reliable cutting operation. We design our products to meet the needs of customers using the latest CAD software. Our skilled and dedicated work force then proceeds to manufacture using state-of-the-art equipment and methods. Each piece of machinery produced is thoroughly inspected and test-cut before it leaves our plant. If you have any questions regarding our company or wish to discuss your cutting application, please do not hesitate to contact me by phone or email. Copyright © 2019 Baxter Verticut Inc.